Li Lin Teo, a Singaporean, studied with Dennis Murdoch at the Royal Academy of Music on an Associated Board Scholarship and won most of the piano prizes, including the Macfarren Gold Medal – the highest award for piano playing at the Academy. She also participated in Master Classes with Vlado Perlemuter, Guido Agosti and Carlo Zecchi in Europe. After the Academy, she studied with Louis Kentner for 4 years. Later, she was to combine teaching with concerto engagements, solo and duo recitals, and chamber music in U.K (including Wigmore Hall and the South Bank), European countries, Singapore, Colombo, Hong Kong and Australia together with Radio and T.V. recitals in France and the Far East. In 1988, she became an examiner for the ABRSM and in 1992 an adjudicator for the British and International Federation of Festivals where she was invited to adjudicate in Sri Lanka; the Stratford & E. London Festival, Godalming Festival, Cheltenham Festival, Saltburn Festival, Mid Somerset Festival, Derby Arts Festival and North Field Festival in Birmingham. She was also made an Associate of the RAM for “distinguished services to music” in 1992. Other diplomas achieved include the LRAM, ARCM(hons), and LRSM. Now she has a large teaching practice at home, and at North London Collegiate School, where she has numerous Distinctions and prize winners in Associated Board Examinations and competitive festivals. BBC Introducing Classical Artist – Yume Fujise is a Japanese violinist currently living in London. Recently she has been appearing live on BBC Radio 3 In Tune on numerous occasions and has performed in major international venues, such as the Wigmore Hall, Royal Festival Hall, Suntory Hall (Tokyo) and Forbidden City Hall (Beijing). Yume has been a prize winner at numerous competitions, including North London Festival D’Addario Competition (2017), The EuroAsia International Competition (2015), Singapore National Teachers Association Competition (2010), and Trinity London Competition (2005). 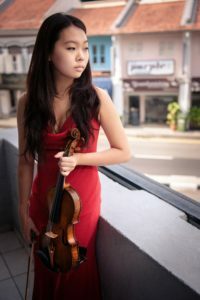 Yume performs regularly as soloist and has appeared with orchestras such as the Braddell Heights Symphony Orchestra, Hague Philharmonic Orchestra, Singapore National Youth Orchestra, Essex Youth Orchestra, Kingston Chamber Orchestra, Royal College of Music Philharmonic and Saffron Walden Symphony Orchestra. She has also performed at music festivals, including a concert in Saanen Church at the Menuhin Festival Gstaad. After starting the violin at the age of three, Yume was invited to study at the Yehudi Menuhin School with Lutsia Ibragimova and at the Kunst Universität Graz with Boris Kuschnir. Yume is currently studying at the Royal College of Music, London (RCM) with Mark Messenger on a full scholarship. During her short time at the RCM, Yume has already won the 2014 and 2018 Violin Competition and 2015 Concerto Competition and 2017 Concerto Competition. In 2017, Yume performed Brahms Violin Concerto under the baton of Maxim Vengerov and performed numerous recitals and concertos in Europe and Asia. As well as performing solo, she is an avid chamber musician. She was invited to take part in the Seiji Ozawa International Academy in Rolle, Switzerland 2017. In the summer of 2018, Yume will take part in Seiji Ozawa International Music Festival in Matsumoto, Japan. Yume has also joined Nicola Benedetti’s quartet alongside Benjamin Gilmore and Leonard Elschenbroich. Yume has participated in masterclasses with world-renowned artists including Ivry Gitlis, Pinchas Zukerman, Shlomo Mintz, Zakhar Bron, Maxim Vengerov, Pierre Amoyal, Ana Chumachenco and Steven Isserlis as well as receiving frequent lessons with Alina Ibragimova. She is grateful for the generous support of the Soiree d’Or Scholar Foundation, Hattori Foundation (Junior Award & Senior Award) Lee Abbey Award, Henry Wood Accommodation Award, Talent Unlimited and Mr. & Mrs. Rin Kei Mei. Yume plays on a Giovanni Battista Guadagnini, ‘ex –Yankelevich’ 1752 which has been generously loaned to her by Florian Leonhard Fine Violins. Tom Hicks is a pianist from Guernsey. He has been awarded first prize in the Canolfan Gerdd William Mathias Piano Competition, first prize and the European Piano Teachers’ Association (EPTA) UK Salver in the Croydon Advanced Piano Concerto Competition, and first prize in the EPTA UK Piano Competition, the Beethoven Piano Society of Europe Junior Intercollegiate Competition and the Junior Bakst Memorial Prize for the playing of Chopin. 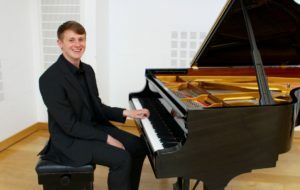 After lessons in Guernsey with Mervyn Grand he gained a place at Chetham’s School of Music in 2009, studying with Murray McLachlan, with whom he continued on the prestigious joint course at The Royal Northern College of Music and The Manchester University. Tom is now a master’s candidate at Yale University School of Music where he studies with Boris Berman. He also plays regularly to musicians including Dmitri Alexeev, Joseph Banowetz, Michel Beroff, Philippe Cassard, Peter Donohoe, Christopher Elton, Peter Frankl, John Gough, Ronan O’Hora, Stephen Hough, Leslie Howard, Eugen Indjic, Vanessa Latarche, John Lill, Hamish Milne, Jon Nakamatsu, Steven Osborne, Dina Parakhina, Daniel-Ben Pienaar, Pascal Rogé, Martin Roscoe, Kathryn Stott, Vladimir Tropp, Simon Trpcezici, Nelita True and Catherine Vickers. He has an expansive repertoire spanning from Scarlatti and Bach through to Shchedrin and Silvestrov and has performed in venues such as St James’ Piccadilly and St Martins in the Fields in London, The Pump Rooms in Bath and The Bridgewater Hall in Manchester. Highlights in 2015-2016 include a performance at London’s Wigmore Hall and the beginning of a five-part cycle of the complete Rachmaninov Concerti with the Stockport Symphony Orchestra. Tom also performed this cycle with the Guernsey Sinfonietta and their conductor Sebastian Grand between 2011-2015 as well as Brahms’ First Piano Concerto (2014), Beethoven’s Third Piano Concerto (2015), Schumann’s Piano Concerto (2015), Mozart’s Double Piano Concerto (2013), Gershwin’s Rhapsody in Blue (2013) and Saint-Saens’ Carnival of the Animals (2012) with orchestras across the UK. As a versatile musician, Tom is a skilled accompanist and chamber musician, and has enjoyed coaching from Boris Berman, Francis Brancaleone, Leonard Elschenbroich, John Gough, Ralph Kirshbaum, Elena Nalimova and Jeremy Young. He is active as a conductor, having received coaching from Mark Heron and Stephen Threlfall and, in 2012, he co-founded Guernsey based modern music ensemble, Terra Nova. Tom is grateful for financial assistance from the BWCI Foundation, The Countess of Munster Musical Trust and Rothschild. 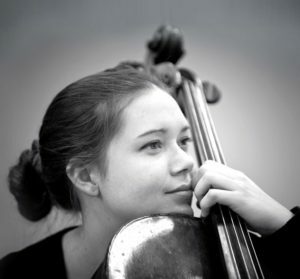 In May 2012, Vashti Hunter became the first British cellist ever to be awarded a prize at the International Cello Competition ‘Prague Spring’ in its 65 year history. She won her Laureate title playing the Dvorak cello concerto, conducted by Koji Kawamoto with the Pilsen Philharmonic Orchestra in Dvorak Hall, Rudolfnium, Prague. Vashti has performed in other prestigious halls throughout Europe, including the Wigmore Hall, Barbican Hall and Royal Festival Hall, St John’s Smith Square, London, Schoenbrunn Palace in Vienna, National House of Vinohrady in Prague and the Salle Moliere in Lyon. She has played concertos with, among others, the Pilsen Philharmonic in Czech Republic; Filharmonica Brasov, Bacau Philharmonic Orchestra, Dinu Lipatti Orchestra in Romania; the Göttingen Symphony Orchestra, the Braunschweig Dom Sinfonie Orchester, the Südwestdeutsches Kammerorchester Pforzheim in Germany; the London Schools Symphony Orchestra and the Southbank Sinfonia in England. Vashti’s performances have been recorded for the BBC, SWR (German South West Radio), NDR (North German Radio), RAI (Italian Radio), ORF (Austrian Radio) and on KBS ‘Classical Odyssey’ (Korean radio and television). Much in demand as both soloist and chamber musician, she has been invited as soloist to important festivals such as PODIUM festival Esslingen, Lockenhaus, Ernen, DAVOS Festival Switzerland, Heidelberger Frühling, Festspiele Mecklenburg-Vorpommern, Prussia Cove Open Chamber Music UK, Serbia Cello Fest, Amsterdam Cello Bienaale, Encuentro de Musica y Academia Santander, Aurora Festival Sweden and Shanghai Chamber Music Festival. An avid chamber music player, Vashti has collaborated with eminent artists such as the ‘Quartetto di Cremona’, Martha Argerich, Ivry Gitlis, Pekka Kuusisto, Susan Tomes, Erich Hörbarth, Antje Weithaas, Radovan Vladkovich and Bengt Forsberg. As a founding member of Trio Gaspard, she studies with the renowned professor and previous member of the Alban Berg Quartet, Hatto Beyerle, who has called them ‘The best Piano Trio I have ever had or heard’. The ensemble has numerous prizes in international competitions. They won 1st prize at the 5th International Joseph Haydn Chamber Music Competition in Vienna in March 2012, 1st Prize and special prize at the 6thInternational ‘Joseph Joachim’ Chamber Music Competition in Weimar and 1st prize at the International Chamber Music Competition in Ilzach France. Vashti has benefitted from solo masterclasses with Natalia Gutman, Steven Isserlis, Anner Bylsma, Bernard Greenhouse, Gary Hoffman, Alexander Rudin, Arto Noras and Torleif Thedeen. She has also had the fortune to learn from Ferenc Rados, Petr Nagy, Johannes Meissl (Artis Quartet), Gerrit Zitterbart (Trio Abegg), Avedis Kouyoumdjian and Peter Cropper (Lindsay Quartet). An experienced and much sought-after orchestral player, she has been invited as guest principal cellist of the Olso Philharmonic Orchestra in Norway and the Scottish Chamber Orchestra in the UK. She is a member of Camerata Nordica in Sweden and Kammerakadamie Potsdam (ECHO prizewinner 2015). She will also be perfoming this year with the Chamber Orchestra of Europe. Vashti recently graduated with top marks on the prestigious ‘Konzertexamen’ solo course with Leonid Gorokhov at the Musikhochschule in Hannover Germany, where she was supported by generous awards from the Leverhulme Trust and Deutsche Stiftung Musikleben. She is currently based in Berlin, where she is mentored by Wolfgang Emmanuel Schmidt. Mariko made her first concerto appearance age nine under Dr Ruth Gipps, subsequently going on to study at the Guildhall School Junior Department with Professor Joan Havill where she won the prestigious Lutine Prize. This led to concerto appearances at the Barbican Hall and St Giles Cripplegate as part of the City of London Festival. During this time she also took up composition with Gary Carpenter, receiving a prize for her Oboe Sonata. She was awarded the Principal’s Prize on graduation from the Junior Department and went on to continue her studies at the Senior Department, with both teachers and also Simon Bainbridge, graduating in 2000. Her Piano Sonata, commissioned and performed by Helen Reid, in 2004, was premiered at Bridgewater Hall, Manchester. 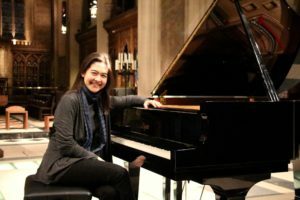 More recently her piece for piano four hands “Travels Through a Mist of Chinese Mountains”, written for her duo with Julian Jacobson, has received critical acclaim. The duo, formed in 2011, has established itself as an ensemble of rare distinction, vitality and originality. A dedicated and sought-after teacher, Mariko taught for many years at Junior Guildhall and currently teaches at the Yehudi Menuhin School. Jonathan West started learning the horn at the age of 8. In his teens he studied privately with Hugh Seenan and Douglas Moore. After taking a degree in engineering at Kings College London, Jonathan studied music for 2 years as a postgraduate student at the Royal College of Music under Douglas Moore, but decided against attempting a career in music and returned to engineering while continuing to play the horn as an amateur. In 2006 he performed Mozart’s 4th Horn Concerto with the Boots Orchestra in Nottingham, and the following year led the horn section of the Djanogly Community Orchestra in Nottingham in a performance of Schumann’s Konzertstück for four horns and orchestra. In 2011 he performed Richard Strauss’ 1st Horn Concerto in a charity concert with the Brent Symphony Orchestra. 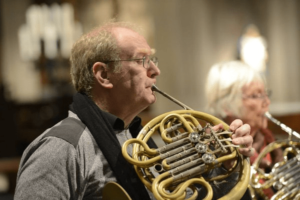 Jonathan is the principal horn of the Amati Orchestra and of the Brentwood Philharmonic Orchestra and is much in demand as an extra with other amateur orchestras in London. He also plays with St. Clements Wind Ensemble, who have performed his arrangements for wind ensemble of Brahms’ Serenade No. 1 and Liszt’s 2nd Hungarian Rhapsody in concerts at the Edinburgh Fringe Festival. Andrew Lewandowski took up the clarinet aged 12 as a pupil of John Mackenzie in London, followed by a long association with Sidney Fell, (former principal clarinettist of the LSO) during which time Andrew gained a joint honours degree in music and physics. 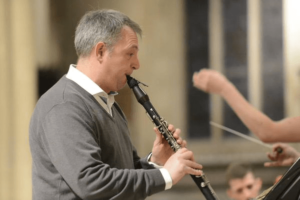 Andrew is a member of several of London’s leading non-professional orchestras which include, Morley Chamber Orchestra, The Royal Orchestral Society, and is the principal clarinettist of the recently formed Amati Orchestra. He has performed at some of London’s top venues including Fairfield Halls, St. John’s Smith Square, The Southbank and has played at the Henry Wood Hall as part of two collaborations between The Rehearsal Orchestra of London and The Wagner Society which featured Wagner’s Tristan and Isolde and Parsifal. He has recently performed a number of concertos, including a performance of Mozart’s Clarinet Concerto with Amati Orchestra, the Tartini/Jacob Concerto, and an arrangement by Robin Weddererburn of a Handel Oboe Concerto, both with West London Strings. Andrew is a very active chamber musician and performs with various groups and ensembles. He regularly performs as part of Wild Rose Concerts at Benslow Music Trust which looks to raise funds and support the Benslow Instrument loan scheme. 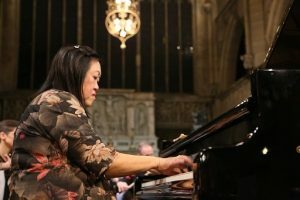 Susan gained a full scholarship at 18 to study both her Undergraduate and Postgraduate studies at the prestigious Royal College of Music London. Opera roles include: Contessa (Le Nozze di Figaro), Cio Cio San, Kate Pinkerton (Madama Butterfly), Donna Anna (Don Giovanni), Erste Dame (Die Zauberflöte), Fiordiligi (Cosi Fan Tutte), Fedon (Satie’s Socrates), Kätchen (Werther), Ida (Die Fledermauss), Ines (Il Trovatore), Leonore (Fidelio), Michaella (Carmen), Olga (Merry Widow) Poppea (Efthymiou’s Fragments of Sun), Santuzza (Cavalleria Rusticana), with companies such as Opera Holland Park, Opera de Baugé (France), Classical Opera Company, Opera London, Opera Vera, Charles Court Opera, Minotaur Opera, Kentish Opera, Enharmonia Lirica (Italy), Regent’s Opera, Woodhouse Festival Opera, and English Opera Singers. Highlights include performances at Sadler’s Wells, Bath International Festival, the Buxton Festival, Salzburg International Festival, the Lindbury Studio Covent Garden and tours in Europe, Hong Kong and Australia. Susan has premiered and recorded as soloist many brand new works including the award winning, Karl Jenkins’ “Armed Man’s Mass for Peace” (subsequently recorded for Virgin Records and reaching No 1 in the British Classical Charts) at the Royal Albert Hall, Amy Wurtz’s “Message from the Soul”, Matthew West’s “Metamorphosis” (Broadcast on Radio 3), Davidson’s “Lord of all Creation”, Darren Bloom’s contemporary arrangement of Schubert Songs with the Ossian Ensemble at St Martin in the Fields, also premiering the role of “Poppea” in “Fragments of Sun” and “Susan” in “Parting” (roles especially written for her voice) by Litha and Effy Efthymiou for Tete a Tete Opera at the Riverside Studios London and King’s Place London. She has also been interviewed and sung live on BBC Radio, E4 television, and Susan was selected to appear and perform in the Hollywood film called if only in which she sings “Je veux vivre” from Roméo et Juliette by Gounod as the character “Melvina Walters” with Jennifer Love-Hewitt . She also appeared in the Turandot Opera Scene in “Mission Impossible 5 – Rogue Nation” with Tom Cruise. On Stage Susan sang in the London premiere of the play “As I Like It” by Amanda Eliasch later being pictured in “Hello!” Magazine. Susan is equally in demand for her concert work and in Oratorio such as Mozart’s Requiem, Masses, Exultate Jubilate, Greig’s complete Peer Gynt (In Norwegian), Verdi’s Requiem, Brahms’ Requiem, Dvorak’s Te Deum, Vivaldi’s Gloria, Canterloube’s Chants d’Auvergne, Vaughan Williams’ Sea Symphony, Haydn’s Nelson Mass, Rachmaninoff’s Vocalise, Mahler’s 4th Symphony, Szymanowski’s King Roger, Stravinsky’s Les Noces, Judith Weir’s Storm, Coleridge-Taylor’s Death of Minnehaha and Orff’s Carmina Burana at venues including the Royal Albert Hall (including the Proms), Salzburg International Festival, I Malatesta Opera festival (Italy), Symphony Hall Birmingham, St John Smith Square, St James Piccadilly, Cadogen Hall, St Martin’s in the Field, and the Fairfield Halls. Susan won the “Umberto Giordano Prize” in the “12th International Umberto Giordano Competition” and recently sang on Italian television (Rai Due). Susan has given masterclasses in Australia, has sat on audition panels for Lost Chord outreach project, taken singing workshops for London Philharmonia Orchestra, conducted Queen’s Gate Girls Chamber Choir for 12 years and she has taught English Song at the Cornish and American Song Institute (CASI) for their summer courses for young professional singers for the past three years. Susan’s voice has even been turned into an “App” which triggers when smart phones are held over large scale works in “Military Ribbons” touring art exhibition by Matthew Maxwell. 2016 sees Susan being turned into a hologram for the world’s first feature length holographic film “Symphony for a Lost Generation”, the role of “the Virgin Mary” in a new contemporary opera of the Nativity, Chopin’s full songs in Polish at St John’s Smith Square to be recorded for her debut album with Sleeveless Records to be released in 2017.